A sleepless night on the streets of Toronto was well worth the opportunity to be right at the beginning of the line to meet Jimmy Page. It was a moment in time that seemed to stand still; yet it happened so quick that it was a blur. The camping over night was made more enjoyable with the help from the other folks in line. A friend from Ohio and Waterford came for the event and to camp out with my son and I overnight. Three young guys made the trip from Buffalo to be there. They brought with them a guitar and entertained the line throughout the evening with various songs. It was impressive to see how everyone there was eager to share their love of Zeppelin and Mr. Page. 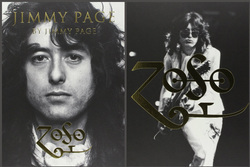 Once the morning arrived, we were lead into the store to purchase a copy of 'Jimmy Page by Jimmy Page', which guaranteed us a wristband to be one of the lucky 300 people who would have the chance to meet Jimmy. He was there to stamp our books with the custom made Zoso stamp that also included the city's name and date. Once being fitted with the wristband (pictured above), we were allowed to leave for a few hours. It was time to change, freshen up at the convenient Timmies across the street and get some breakfast. We were still in a daze thinking, "Ok, is this really going to happen, are we going to meet Jimmy?". Shortly after 12, we decided to head back over to the bookstore and rejoin the newly made friends in line. The fact that they had wristbands grouped and colour coded was a great idea. Kudos to Indigo for that. Shortly after 2pm, they began leading our group into the store. It was nice to get out of the blazing heat. They showed us where to stand, which was reminiscent of a bank customer line. We were all in the front row, facing a vintage looking desk, with promotional posters from Genesis (Book publisher) of Jimmy Page with his book. To entertain us, the store had Zeppelin tunes playing. Surprisingly, they gave most of us in the front a copy of the book. There were various photographers from multiple news outlets there to document the event, and we were asked a few times to pose with the books. A couple minutes before 3pm, the expected time of Jimmy's arrival, they announced that there was a music legend in the house and to get our cameras ready. The crowd began to cheer, cameras up in the air and soon, with his familiar saunter, Jimmy Page was walking right in front of us. In his customary black attire, scarf and Rayban sunglasses, Jimmy assumed his position behind the desk. With microphone in hand, he began by thanking Toronto for the welcome and then spoke about his book for a couple minutes. Then it was time for the book stamping to commence. The line was moving at a steady pace. Once we were at the front of the line, we handed over the camera to the assistants. My teen son stepped up to approach Jimmy. I could hear Jimmy ask him his name and if he played guitar. My son answered his questions, including a "Yes" to the guitar question, which produced a big smile on Jimmy's face as he reached his hand out to shake my son's hand. After stepping down with his book, I approached the step. As soon as I was at the desk, Jimmy extended his arm to shake my hand. With a shaking hand, I shook his hand and said hello. As he was stamping, I used the short 20 seconds face to face with him to thank him for 'Since I've Been Loving You', my all time favorite song. He thanked me, passed my book to the assistant next to him. As they were guiding me off the step, I told Jimmy what an honour it was to meet him and wished him a great evening. And just like that, it was over. I rejoined my son and the others in front of us in line and we all shared the moment, with big smiles and still in disbelief that this event just happened. During the remaining time of his appearance, we stood around watching ,clutching our books. I ran into some other friends, including the Zepology guitarist Garry McDougall who was equally excited to meet Jimmy. A gentleman from Ramble On Radio spoke to my son and I about meeting Jimmy. It was nice meeting Brian who included the event in one of his blogs. Found here. As they counted down the last handful of the 300 that were granted wristbands, it was hard to believe that 90 minutes was already over. Once they thanked Jimmy for being there, he stood up, put on his black leather jacket and with a handful of security guards, Zeppelin music playing, he was lead out of the store. The excitement was still in the air as some of us still stood around sharing stories of Zeppelin and taking photos of the displays remaining on the stage. Eventually the staff had dismantled all the ropes and signs and wheeled the remaining books away. Just like that, it was over. Later that evening, back home, it was still hard to believe that the events of the day had transpired. It felt like a dream, one that you didn't want to wake up from. It will forever be one of those days that I will never forget. Sharing it with my son and dear friends, as well as making new friends just make the day all that more memorable. July 21, 2015 will forever be known as the day that I Met Jimmy Page.